How Do Cadaver Dogs Work? As many will have heard in the news over the past decades, the police are increasingly deploying the skills of specially trained dogs in the hunt for human remains - such as the search at a former children’s home on the island of Jersey and in the high profile searches for missing girl Madeleine McCann. If you’ve ever wondered how these specialist sniffer dogs are trained or how they go about their work, K9 Magazine spoke with PC David King about what goes into training and working a cadaver dog. It is not until you actually own a dog is it that you realise just how strong the canine sense of smell is. I always knew that dogs could find us before we could find them, but as a dry nosed amateur, I did not fully appreciate the extent of their ability until I learned about human remains detection dogs. For centuries, dogs have assisted members of the Police force with such diverse jobs as detecting explosives, crowd control, detecting narcotics and physically apprehending criminals. But up until relatively recently human remains detection, or cadaver dogs and their human colleagues have been an under represented minority in the field of canine related police work. The common misconception has been for a while that cadaver dogs do not assist in crime prevention, they only assist in the collection of evidence. Although this is technically true, the life changing capabilities of these remarkable dogs are unequivocally staggering, as I was about to find out. A chilly, January afternoon in Hutton, Lancashire was the setting and Police Constable David King was my host. Meeting David, a serving officer since 1981 with over seven years experience with Police dogs, four of which specifically with cadaver dogs, was one of those experiences where all of your preconceptions are blown out of the water. It was one of those times where someone’s face could be no further from the image conjured up by the preceding telephone conversations, and to add a dash of surrealism, I was to be interviewing a police officer, something which half tempted me to use phrases like ‘for the benefit of the tape’ and ‘interview terminated at fifteen hundred hours’. I decided not to upon being shown to the room where PC King was waiting for me. You see, David was not the ‘Reg Hollis off the Bill’ type bumbling stereotype his telephone demeanour had suggested, he was in fact a man mountain who’s very presence seemed to command respect from his peers at the station and from anything on four legs within a square mile, add to this the fact that upon shaking his hand I realised that I was about to speak to a very, very strong man. I spoke to PC King about many things canine related, including drugs, toys and death. Here is how it unfolded. K9. How did you arrive at this vocation? DK. I became a police officer in1981, and went on to serve in various parts of the constabulary. I really enjoyed working in uniform, but after about ten years I decided that I wanted to specialise. I wanted to remain in uniform so I became a Police Dog handler. K9. So you carry out traditional Police duties as well? DK. Not anymore. My core task is dog training and instructing the dogs when searching for human remains. K9. Do you consider yourself a Police officer who works with dogs, or a dog handler who works for the Police? DK. (laughs.) You’ll get me into trouble with that one. No, the force ethos is that you are Police officers who work with dogs, but the reality for most dog handlers including myself is that you are definitely dog handlers first, who work for the Police. K9. What is the best breed of dog for this type of work and why? DK. We tend to use gun dog breeds for most work requiring a specialised dog. 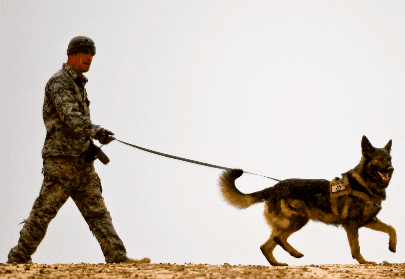 This includes cadaver dogs, but they are also excellent for detecting explosives and drugs. The reason for that is that Labradors and Spaniels represent a large portion of all dogs that are bred for work, and as such they tend to have better natural abilities. K9. Given the sensitive nature of the work, are there any special qualities you look for when selecting dogs to work with? DK. Ultimately the dogs have to be hard working dogs, that are willing to retrieve. But not special in the respect that we worry what people think about them, that is immaterial to us. It is pretty much the same criteria we require for dogs that search for explosives, we need highly motivated dogs that like to play. DK. My current dog (Missy, an extremely affable Golden Retriever) is trained as an active dog. Her reward when she has a find is food. If I was to train another human remains dog today the reward I would use would be a toy rather than food, simply because of past experiences I have had. K9. Narcotics dogs are trained with pseudo-narcotics, what do you use to simulate human remains? K9. What is the protocol when a person is missing feared dead, how do things unfold? K9. Obviously it is a distressing experience when the dog has a find how do you praise or reward the dog in this situation? DK. Although I am concerned about the job that I am doing and what it means to people, and I have feelings myself, I view all searches as training for my dog. You’ve got to be professional. One thing to remember is that the searches are almost always done away from the public eye, to protect the feelings of the people involved. But when Missy does have a find, it is imperative that I remain professional and give her praise in the usual way, which is lots of hand contact and verbal praise when she signals. K9. Do the dogs pick up on any emotion involved? DK. As soon as Missy signals a find, I move her away from the respective areas involved and go on to conduct the investigation with her out of the way. That is the only way you can do it. K9. Your job is one of contrast. You have the pleasure of working with the dogs you have spent a long time training, but you also have to deal with the less than pleasant issue of dead bodies. Does one cancel out the other? DK. No. Although it is very distressing, the majority of the time I am searching for people who have been murdered. There are also people who have gone missing, and quite a lot of times, I am searching for elderly people who have simply got lost on their own and succumbed to cold or fallen down. I always see it as allowing people who are related to the deceased to have closure. If it is murder, it allows us to continue the investigation, if it is a missing person, it finally allows people to grieve and say that that person is gone. That in itself gives me a degree of pleasure. I am able to let people carry on living their lives, whereas beforehand they would not have been able to do so. K9. How do switch off from work when you get home? DK. Again it comes down to experience of being a Police officer. You see a lot of things that upset you, not just death. You have to maintain a degree of distance. You cannot allow yourself to be affected. But then again, the Police force is changing. There have been situations where I have seen something that has caused me a great deal of concern, and the Police are now quite happy to assist with de-briefings and the like, even psychological assistance is commonplace to enable officers to get over something that has traumatised them. K9. Does the nature of the job have any adverse affects on your life outside of your job? K9. What goes through your mind when the dog begins to signal that she has a find? DK. The initial thought that goes through my mind is ‘Great, I’ve got a find’, Simple as that. Although it is a delicate thing that I’m searching for, I am still a dog handler and I’m getting a result. Which is the reason that I’m there. After the interview David took me out to meet Missy. She was in a pen at the other end of the row of kennels. One thing I noticed was that every single dog in between David and Missy was deliriously excited by David’s presence. It was like a reverse domino rally as I watched each dog spring up in turn as David walked past them, politely acknowledging their presence. Missy was as excited as anybody else in David’s presence and she soon demonstrated to everyone present exactly how well trained she was. As we walked with her David explained some of the science behind human remains detection. DK. When a person dies, the body automatically begins decomposing. The rate of decomposition depends on the conditions. If a body is buried it will be slower than if it were in the sun. If it is mummified, the process will be even slower as the covered body will be less susceptible to the decline induced by heat, or the presence of insects. K9. What is it exactly that the dogs trace? DK. The decomposing body is liquefied from the inside, by enzymes in the muscle tissue. This causes the body to swell, and give of the gas Hydrogen Sulphide. This what the dog will pick up on. There is H2S, present elsewhere in the atmosphere, which is why we use the pig. So that the gas is not taken in isolation and the dog is more familiar with what it should be seeking. As we move forward, man's relationship with dogs shows no signs of slowing down. The role of the dog in assisting us in everything from identifying the early warning signs of cancer to helping us find the bodies of missing loved ones is sure to keep the bond between human and canine strong and interesting for centuries to come.